The TSSG won funding from Ireland's Higher Education Authority HEA PRTLI for a research programme called M-Zones (in partnershop with TCD and CIT) and part of this was to fund a research building in WIT. This funding has been combined with Enterprise Ireland funding for an incubation centre for new business to create WIT's Research and Innovation Building. 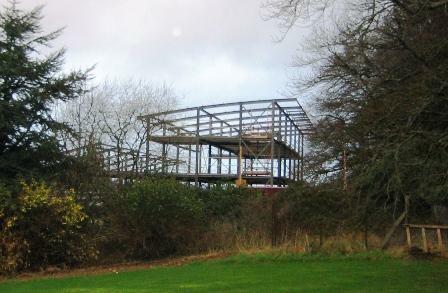 The building is due to open in September 2005, and is progressing well as the photo demonstrates. The building is located in WIT's new Carraiganore site, on the banks of the river Suir.